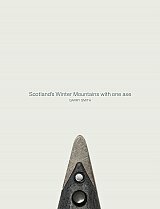 Scotland's Winter Mountains with one axe - A selection of thirty easily accessible, done in a day, mountain journeys. All of Scotland's classic winter ridges are described in detail, including the Aonach Eagach, Liathach and An Teallach. The big gullies of the Northwest are also included, such as Deep South Gully on Beinn Alligin and Morrison's Gully on Beinn Eighe. All routes fall into the lower categories of climbing grade (I and II), meaning they are perfectly suited for a traditional approach, with just one axe and minimal amount of gear, if any. Three easy routes have been included to provide a step-up from winter hillwalking. The book contains background information and an easy-to-follow description for each of the selected outings. It is laid out in a contemporary format and supplemented with bespoke colour maps and 116 colour photographs showcasing Scotland's spectacular mountain scenery. This is an ideal book for anyone who has a love for Scotland's mountains and will take a reader on the best winter journeys from the comfort of a favourite chair. The author has taught climbing and mountain skills for 24 winter seasons in the Highlands.